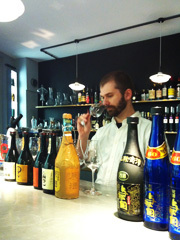 A weekly charity event called “Japanese Alcohol” was held every Saturday in March. 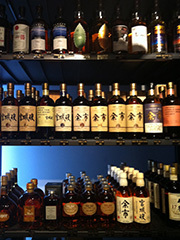 It was sponsored by LMDW Fine Spirits which is well known for its large selection of whiskys and spirits. A total of 1046.83 Euro will be donated to “Save the Sake in Tohoku” which supports the restoration of the Sake industry in the affected area. The donation comprises 5% of the entire sales of Japanese Alcohol along with the cash collected during March. The support activities for Tohoku should continue to run for a long time; I was reminded of the importance of the support works for Tohoku after having discovered that there are people who are willing to offer help and empathise with our pain beyond the the barriers of language, nationalities and borders. I want to take this opportunity to thank all the staff at LMDW Fine Spirits and their customers who made this event a huge success. 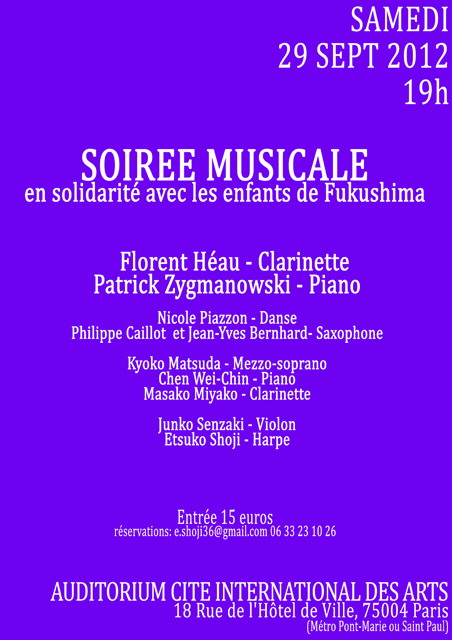 Musicians of each country gathered for children of Fukushima to give an especial concert. All profits of this concert will be sent to the GREEN Camping of Tohoku through Japonaide. *GREEN Camping of Tohoku is the association which organised some campings for children of Fukushima who were not able to play outside after the earthquake disaster. date and time: On saturday 29 September 2012 at 7 pm. 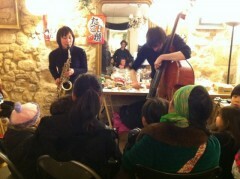 Japonaide held a meeting at the Temple du Marais in Paris last march 17th. It was followed by a short music recital to which many of you managed to come, though the rain had been falling very hard all day. Thank you very much to all of you. The meeting had something of a university lecture, with pictures and movies shown on screen while specialists stood up one after another to explain the current situation in Japan. It was also an occasion for some to discover the Kinka Scallop and Ascidian Conservation Project, and its work in the region of Ishinomaki. It doesn’t matter which country we come from, it is always hard to remain calm and unaffected while looking at these pictures, some of which were taken right after the tragedy last year. And everytime we see those photos it makes us realize just how much was lost, and how much there is to do still, before everything goes back the way it was. With soprano Ai Ito and Paul Montagu on the piano, the concert that took place after the meeting had a particular tone to it, with mostly songs from the french repertoire. The two musicians played with such grace and cleverness, that the audience seemed to be left wandering through imaginary oceans and fishing ports in the far east. One year has passed since the tragedy, but the reconstruction work, has barely begun yet. Today still, and we believe for many years to come, the Japanese will need your support and your prayers before they can see the light. 1500€ were raised during the day, and are to be sent to the East Japan Disaster Relief Christian Network to fund development and reconstruction projects in the Tohoku region. 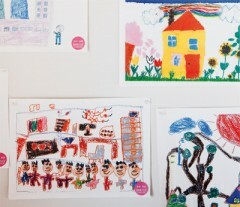 The fourth edition of the “Mini don, Grand don” event was held over three days from the 9th to the 11th of March at the Galerie Marais Ouest in the heart of Paris. The three organisers kindly allowed us to join the volunteer workers and give them a hand on one evening. 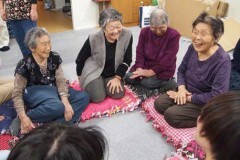 Part of the collected funds were given to Japonaide, and directly sent to the NPO Kisyn no Kai to help with the completion of the “House for everyone” project in Rikuzentakata. 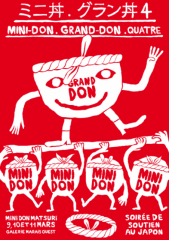 The idea behind “Mini don, Grand don” is to introduce people in Paris with Japanese culture, but it is also a great opportunity to discover the artists who volunteer for the occasion. For the fourth edition, the chosen theme for the event was the word “Party”. The three days were packed full with cultural animations : concerts, rakugo, kamishibai (picture theatre), a drawing exposition,…and passers-by were also able to enjoy some japanese food or take a look at the car boot sale. 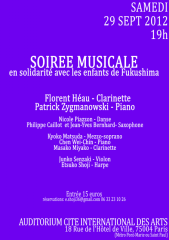 The organisers had several goals in mind while preparing the festival : sending a message from Paris to the victims of the earthquake and tsunami in Japan, for whom the word “party” seemed to have lost its meaning, and also collecting the financial support needed for the reconstruction of the country. With over 400 people gathering around those ideals, and close to 70 volunteer workers, “Mini don, Grand don” managed to remain for its fourth edition a genuinely warm and welcoming event, and more than anything a beautiful demonstration of the friendship between France and Japan. During the event 2825 euros were gathered for the “House for everyone” project, as well as 59 euros collected from the japonaide charity box. The total will be sent to Kisyn no Kai for the completion of the project in Rikuzentakata.We would like to thank the three organisers one more time : Minako, Elodie and Kumi, as well as all the volunteer workers and passers-by who joined in the festivities. In March the La Maison du Whisky will be participating in the general effort to bring relief to the victims of the earthquake and tsunami that hit the north-eastern coast of japan last year. In order to collect funds for those in Japan who have been living in precarious conditions up to this day, the « Maison du Whisky » will be presenting and organising events on the theme of Japanese products all throughout the month. 5% of the benefits made on Japanese products during the month will be sent directly to Japan and help funding the reconstruction of the country. By March 2012, it will be a year from a disaster that stroked the northeast side of Japan. It will be a moment for all who are related to commemorating the event. Guimet museum holds at this occasion an exhibition of wall newspapers which were prepared by the dairy Ishinomaki Hibi Shimbun, the principal paper at Ishinomaki which lost more than 3000 inhabitants by the tsunami. There will be also documentary pictures taken by a French photographer in Japan to describe the circumstances where the reporters of this local paper accomplished their duties. Immediately after the earthquake on March 11th, Ishinomaki Hibi Shimbun was also a victim of the tsunami. Having lost their rotary press, they did not resign themselves to undertake their roles to mediate the information. Every team gathered day after day and made the hand-made wall newspapers which were put up in the evacuation areas and areas which suffered only slightly to assure the access to the latest and trustful news. 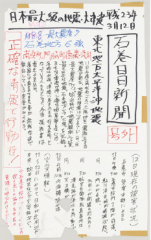 The initiative of Ishinomaki Hibi Shimbun made itself widely known in Japan and aroused a great deal of controversy about the ideal method of the press in emergency. One year from the earthquake. ‘Mini Don Grand Don’, a group of creators from all over the world presenting under the theme of ‘Things across in your mind’, holds the fourth event under the theme of ‘MATSURI-festival-‘ in Marais district, Paris. Total amount of proceeds through this event will be sent to SCHOP-DAN, a NPO providing help to the victims in the damaged area hit by Tsunami with removing debris, and to ‘Home for everyone’ project supported by JAPONAIDE. We address this message to Japanese people all around the world, and to all those who kindly worked with us towards the reconstruction of our country. One year has passed now, since that terrible day. Let us remember and pray together for those who died in the earthquake and for the repose of their souls. Let us pray together for Japan’s future. A prayer for Japan. The traditional evening prayer, Vespers is to be held when night starts falling in Japan. A musical piece in honour of the dead, conducted by Mr SADO of the Super Kids Orchestra. of a long series hit the north-eastern coast of Japan. Together one year later, at the exact same moment, we will observe a minute of silence to honour the victims. For reasons of security please refrain from bringing candles to the gathering. We hope that you will be many to answer our call and give your support to the project ! One year ago, on March 11th, the North-Eastern coast of Japan was struck by a terrible earthquake, followed a few minutes later by a tsunami that laid waste to cities and villages in the whole region. Many buildings were destroyed and many people died in the event.In the aftermaths of the catastrophe, and before the reconstruction of the cities could be properly planned, priority had to be given to providing temporary lodgings for those who had lost their houses. However people soon felt the need for a warm and welcoming place where they could find some comfort and discuss their plans for the future. 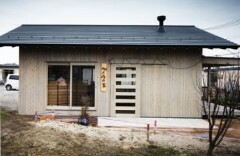 In an effort to alleviate the victims’ sufferings, architect Ito Toyo set out to build the first Home for Everyone (Minna no Ie) with the support of the Kumamoto prefecture. The house was inaugurated in the fall of 2011. Another such Home for Everyone is to be built in Rikuzentakata, for which Ito Toyo required the assistance of several young architects such as Inui Kumiko, Fujimoto Sou and Hirata Akihisa. Ideally, new homes should be built everywhere near temporary lodging areas. Kishin no Kai is the association in charge of the Rikuzentakata project, and was founded by Ito Toyo and other famous japanese architects, including Yamamoto Riken, Naito Hiroshi, Kuma Kengo and Sejima Kazuyo. Now they need our help for the project to be succesful. Zoom Japon has decided to participate to the fund raising campaign, and appeals to all its readers, hoping to gather the 50000 euros needed for the completion of the Rikuzentakata Home for Everyone. The funds will be collected by association Japonaide, and transferred entirely to Kisyn no Kai for the construction of the Rikuzentakata common house.